Wow, this book sounds so unique! I thought it was just a contemporary YA until you mentioned the parallel worlds. I'm really curious about it now, definitely checking it out when it comes out. Wow. I think my mind was simply blown just reading your review, Keertana, to be completely honest. Looking at the cover, I never would have guessed it's like an urban fantasy book with parallel worlds, but I love love love the sound of the parallel world with the whole thing with colors (not to mention the puns you were able to use throughout your review, haha ;)). Although being slow and somewhat strange, I just can't NOT try this book now, Keertana! Something in the way you reviewed this book is yelling at me to pick this one up, and I most definitely will, in hopes that I love this one as much as you did. I am so so excited for this book! I'm glad you loved it - sometimes you and I are dead on for how we feel about books. This one seems pretty subjective, but I am really excited to start. I can deal with slow movement and a lot of setup, especially with more on the way! I think this just got bumped up my review queue! I've seen so many people read this book and it sounds so fabulous! I've actually read The Year of Secret Assignments and loved how she wrote and even though Corner of White isn't in letter, diary, journal entries, I love how she still includes a few snips of Cello as you've mentioned in your beautiful review! And the thought of being introduced to Cello sounds so fanscinating! Espeically with the enemy of Colors and of course for the fabulous characters! I want to meet Madeline and Elliot and Jake. They sound so fantastic how you've described them! I love this review, Keertana! Beautiful review, Keertana. It sounds like an amazing book. I've never heard of a concept like this before and I'm excited to check it out. Ever since Mandee rated this one, I've had every intention to read it. The few reviews I've read recently have all been pretty encouraging, too, and yours definitely seals the deal. I love the sound of Cello and the parallel worlds, and that this sounds just that important bit different from everything else. You also have me very curious about the ending! I can't wait to find out what it is. Great review as always! my friend who works at scholastic just recommended this to me... can't wait to read it! I only just found out yesterday that this has fantasy elements (I know, I know) and so far, every review I've read has been very positive. I don't mind slower beginnings, or slower books if the end is rewarding. In fact, those kinds of reads usually end up being my favorites. Just think of The Scorpio Races. Thank you for the beautiful review. I'll make sure to get a copy as soon as I can. You KNOW I am with you, I loved this book from the beginning, all the way til the end. This is such a lovely review, and it does make me a bit sad that a lot of readers will think this is slow/boring and quit on it. Huh! I have never heard of this but the whole magical world with colors personified really interests the former art major in me! It sounds like this has a lot going on so I'm curious about the slow start you mention, but it's clear you loved it so that definitely puts it on my radar:) Great review! When I looked at the cover, I thought it was contemporary. I had no idea what the premise was or about these parallel worlds until I came across your review. This sounds like an intriguing, unusual read that has definitely caught my interest. Your glowing review has convinced me to check it out! Beautifully written Keertana! I'm so curious to see what my own reaction to this book will be, as I feel as if everyone reading it has either loved it or DNF'ed it. I'll likely read from her backlog firs though. The alternating between our world and Cello is so interesting to me! Not something you often see, reminds me of Phillip Pullman's Dark Materials a bit. I often don't mind slower stories when they're really character driven by wonderful characters, so my hopes are high! 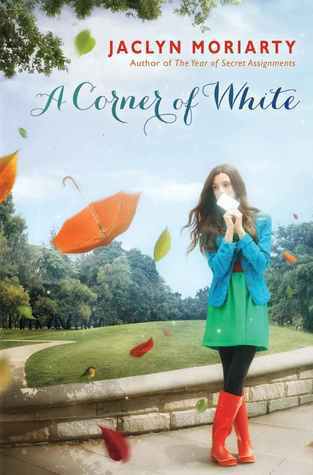 I've read so many reviews now both praising A Corner of White and having found it far too obscure to understand. I really want to find out where I fall on this spectrum - I'm hoping very much that I'm one of those that can really appreciate Moriarty's story. It sounds so strange and whimsical, but, as you put it, definitely different from all the other cliches out there in YA books. I can totally get behind a story with a slower start if I feel like it is well-written and able to build up to something worth the wait. I'm glad you were able to enjoy the story, Keertana, even if you feel that this is one that not everyone can appreciate. That's what makes a story more unique, right? I'm really glad you reviewed this one. I actually ended up with two reviews copies of it but immediately after receiving them heard from two close friends who DNF'd it. Luckily one explained to me why and I think I understand that it's one that has to be read when you're in just the right mood. Your wonderful review definitely has me much more eager to pick it up but I'm waiting for just the right time! I'm actually a little bit nervous about reading this. I love, love, love Jaclyn Moriarty's writing and I know that this is going to be amazing.. and for some reason that makes me anxious about reading it! Strange, I know. This sounds so ambitious and brilliant.. and Moriarty's novels are always so intelligent, so I'm expecting great things when I eventually get around to reading it.